A Package Key is generated when you create an application and associate it with one or more Packages. For more information, see Applications. Note: Package Keys cannot exist without an associated application. 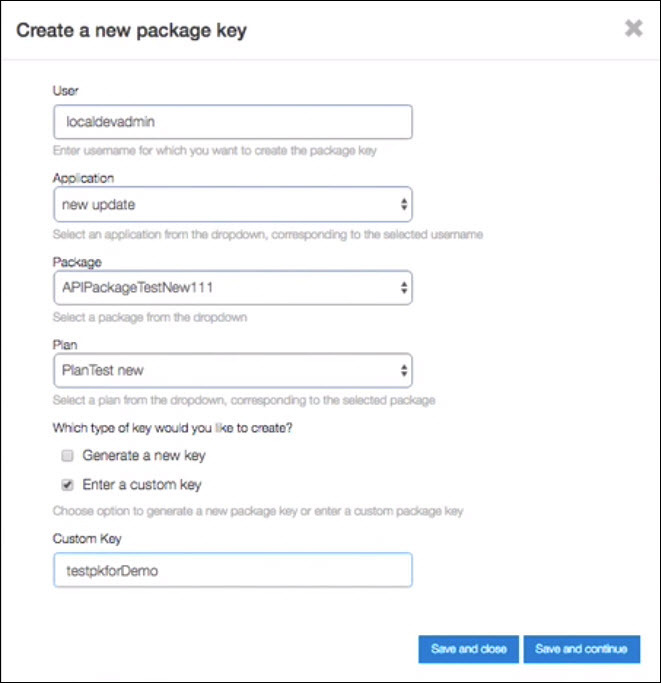 Go to Manage > Package Keys, or click on Package Keys from the Get Started page. The Package Keys page is displayed. On the Package Keys page, click the New Package Key button. The Create a new package key pop-up window is displayed. User Enter or select a username for which you want to create the package key. Application Select an application from the drop-down list corresponding to the selected user. Select a package from the drop-down list. Select a plan from the drop-down list corresponding to the selected package. Enable the checkbox to have a system-generated key value. Enable the checkbox to enter a customized key value in the Custom Key field. Refresh the page to see the newly-created Package Key. Note: Once the Package Key is created, you cannot modify the Package Key. You can only modify the Package Key settings.